Have I ever mentioned green is my favorite color? It is. Every room in my house has some variation of the color green in the decor. 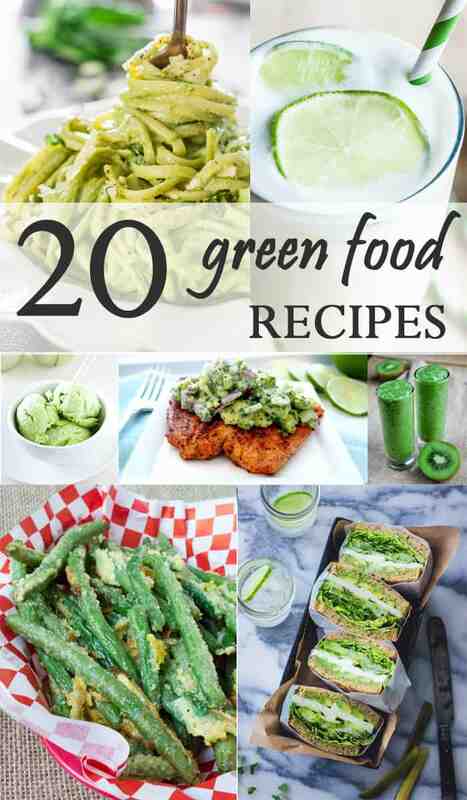 So, it’s not a far stretch that the color green would be the preferred hue for some of my favorite foods! And, with St. Patrick’s Day right around the corner, I thought I’d share with you some of my absolute faves…. What an awesome way to start the day! It’s like power food with a spicy kick. These easy-to-make, savory mini cakes are the perfect afternoon snack. Add some healthy crunch to your next batch of green beans. These are “oven fried”. Classic pasta is immersed in a puree of avocado and spinach and might just be the best pasta dish yet! Greens and nuts are substituted for the classic meat mixture in these easy cabbage stuffed rolls. You had me at crab! Served on a bed of cucumber noodles, this is the perfect meal for a light summer feast. All that is fresh and green, packed with tangy mozzarella between heavenly toasted bread. This inventive side dish combines all the goodness in one bowl. The walnuts are a tasty surprise! What better way to top a perfectly cooked baked salmon than with a refreshing avocado salsa. The combination in divine! A healthy dose of California fruits and veggies come together in this nutrient packed smoothie. I didn’t think grapes could get any better sweeter than they are, but this easy method makes it difficult to keep the bowl filled. Especially with St. Patrick’s Day here, you could always use my instructions HERE to make your own. Another great idea for a healthy and delicious smoothie. Kiwis and cucumbers are a great combo! Hearty with a hint of zestiness, this flavorful soup is sure to become one of your family’s faves. Fresh limes are the star in this refreshing summertime quencher. What a soothing site! A delicious combination of green goodness to serve at your next party or office potluck. Perfect for parties and potlucks, these simple cucumber cups will be devoured before you know it! My mouth is watering just thinking about it! Fresh green apples make a delectable base for this tart treat. Kiwis and limes turn the traditional margarita into a libation you won’t forget.